Foods considered to be slow burning carbs digest slowly. Select slow burning carbs by choosing unprocessed foods high in fiber and by utilizing the glycemic index. The glycemic index is determined by how quickly a food causes blood sugar levels to rise in the bloodstream. Slow burning carbs have a low glycemic index because they are digested and absorbed more slowly than carbs with a high GI, explains the Academy of Nutrition and Dietetics. Slow burning carbs are higher in fiber, protein and/or fat and include a variety of different fruits and vegetables, certain types of grains and most legumes and dairy foods. Cherries, plums, grapefruit, apples, pears, grapes, oranges, prunes, dried apricots, kiwi and peaches are examples of slow burning fruits. Slow burning fruits have a glycemic index of 55 or less, which is true of all slow burning carbs. Filling your diet with low-GI foods may help you reach and maintain a healthy weight because these foods tend to suppress hunger and help with blood sugar control, says the Academy of Nutrition and Dietetics. And if you have diabetes, slow burning or slow release carbs may help you gain better control over your blood sugar and lower both cholesterol and triglyceride levels by improving insulin resistance, according to Diabetes Canada. Peas, carrots, eggplant, cauliflower, broccoli, onions, lettuce, tomatoes, green beans and red peppers are examples of slow burning vegetables. Not only are these veggies a good source of energy, but they are also low in calories and high in fiber, potassium, folate and vitamins A and C. People who eat a diet rich in fruits and vegetables reduce their risk of heart disease. These foods may also offer protection against certain types of cancer, says the US Department of Agriculture. In addition to grains such as rice, slow burning grain foods include bread, cereal, crackers and pastas. Not all healthy grain choices, such as whole-grain oat cereal, are included list of slow digesting carbs foods. Those considered slow burning carbs include oat bran, rolled oats, whole-grain pumpernickel bread, whole-wheat bread, spaghetti, brown rice, pearled barley and wheat tortillas. While spaghetti and other types of pastas are considered slow burning, cooking affects GI. Cook your pasta al dente to keep GI low. When looking to add more slow burning carbs to your diet, the GI Diet Guide recommends legumes, which include mature beans and peas. Kidney beans, butter beans, chickpeas, black-eyed peas, navy beans, lentils and yellow split peas all make good choices. 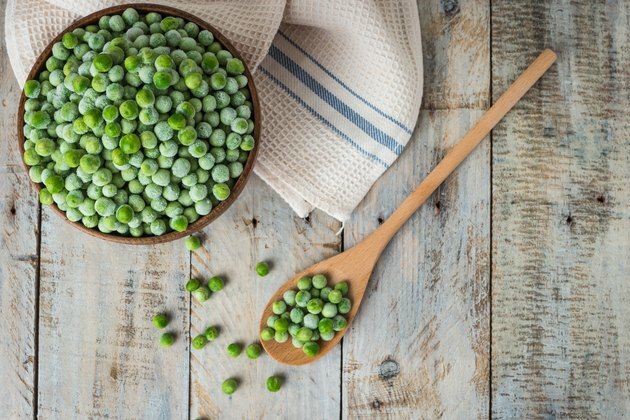 Improve energy levels by adding these beans and peas to your salad, soup and whole-grain side dishes. In addition to being healthy carbs, beans are a good source of protein, as well as zinc and iron. Both milk and yogurt are considered slow burning carbs. While whole milk and full-fat yogurt may be a good source of energy, they are also high in unhealthy saturated fat. So, when it comes to dairy, you need to be mindful of your choices. Healthy slow burning or slow release carbs among dairy foods include skim milk and fat-free, sugar-free yogurt. And for those who don't drink cow's milk, soy milk is also a slow burning carb. Academy of Nutrition and Dietetics: What Is Glycemic Index?